Description: The Physical map of Vermont showing major geographical features such as rivers, lakes, mountains, topography and land formations. 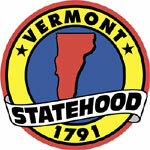 Vermont is a state in the New England area of the northeastern United States. Vermont is the sixth littlest in range and the second slightest crowded of the 50 United States. The Green Mountains are inside the state. Vermont is circumscribed by Massachusetts to the south, New Hampshire to the east over the Connecticut River, New York to the west, and the Canadian area of Quebec to the north. The west bank of the Connecticut River denotes the eastern (New Hampshire) fringe of the state (the stream is a piece of New Hampshire). 41% of Vermont's property range is a piece of the Connecticut River's watershed. Lake Champlain, the real lake in Vermont, is the sixth-biggest group of crisp water in the United States and differentiates Vermont from New York in the northwest partition of the state. A few mountains have timberlines with sensitive year-round high biological systems, including Mount Mansfield, the most astounding mountain in the state; Killington Peak, the second-most astounding; Camel's Hump, the state's third-most elevated; and Mount Abraham, the fifth-most elevated crest. Around 77% of the state is secured by forest; the rest is secured in glade, uplands, lakes, lakes, and swamps. Ranges in Vermont directed by the National Park Service incorporate the Marsh-Billings-Rockefeller National Historical Park (in Woodstock) and the Appalachian National Scenic Trail. Counties and Road map and map image of Vermont.